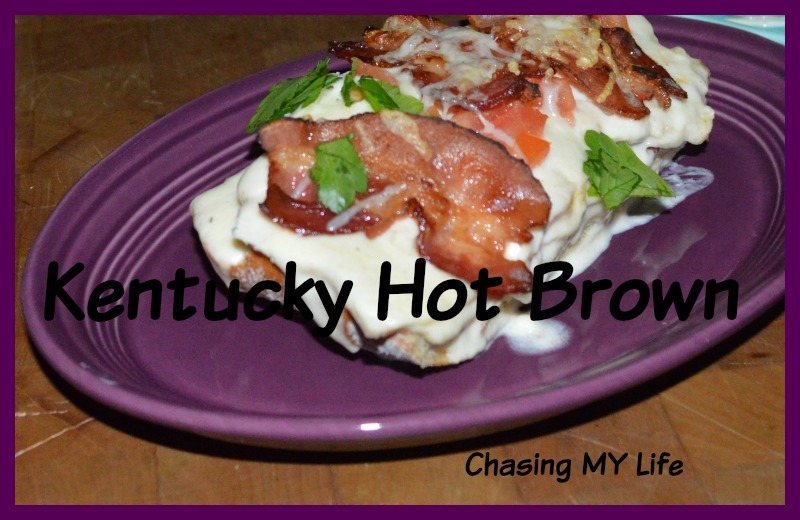 Previously I had made the HOT BROWN from THE BROWN HOTEL from OFF THE EATEN PATH by Morgan Murphy from Southern Living. I had made a couple of small substitutions but we loved it and cannot even think about changing the substitution back. *Preheat broiler with rack 4 inches from heat. *Melt butter in a heavy 2 quart saucepan over medium low heat. *Whisk in the flour until smooth and golden. *Gradually whisk in cream over medium heat, whisking constantly until thick and bubbly. *Stir in 1/2 cup cheese, salt and pepper, stirring to blend. *Place toast slice in the bottom of a lightly greased casserole dish or make them all at once in a foil lined cookie sheet. *Spoon cheese sauce over tomatoes. *Sprinkle with the remaining cheese. *Broil 5 minutes or until cheese begins to brown. *Top with bacon pieces (Next time I will crumble the bacon over top to make them easier to eat. **I didn’t realize I was out, but I was, so I substituted extra sharp cheddar and it was lick the plate clean good.